Place cherry tomatoes on a cutting board. Lay your hand flat on top of them and apply pressure to stop any movement. 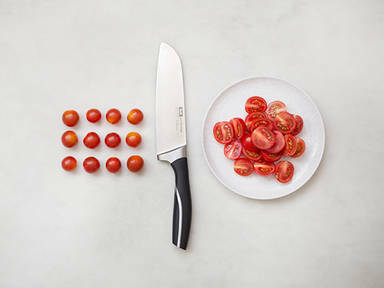 Hold a sharp knife parallel to your palm and make a horizontal cut to halve the tomatoes. This is a great way to prepare lots of cherry tomatoes at once if you’re pressed for time.You can also garnish the chopped tomatoes with basil and some torn mozzarella for a Caprese style salad.